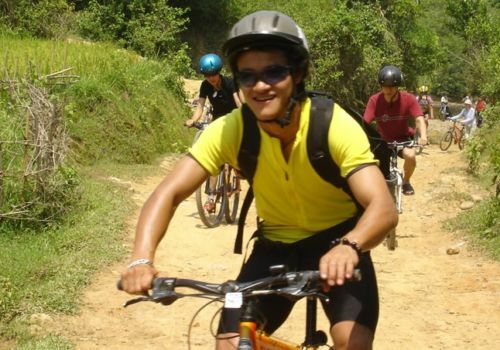 If you enjoy cycling then this itinerary is a great way to explore Thailand. Staying in a combination of three and four-star hotels – as well as experiencing a more traditional homestay – the peaceful regions of northern Thailand where rolling mountains are punctuated by idyllic river valleys is truly a place to kick back and enjoy the simple pleasures of life. This epic journey – which works its way up to the borders with Laos and China – takes in some of the country’s most stirring countryside, visiting fascinating villages, imposing caves as well as quiet temples and lakes. You’ll be picked up from Chiang Mai Airport by your local guide and transferred to the hotel in Chiang Mai. Then it’s time to meet the cycling guides for a bike fitting and a short introductory ride around the old city, allowing you to get a feel for your new wheels. The evening is free to explore Chiang Mai’s famous night bazaar and try some traditional northern Thai dishes at the many food stalls. On the first day of the ride, you will cycle out of Chiang Mai and into the countryside of Mae Jo. Leaving the excitement of the busy city behind, this peaceful ride follows a canal to the Ping River. Cycling alongside rice plantations, through villages and passing local markets, there is little traffic apart from a few scooters going by. In the evening you will arrive at the Hmong Hill Tribe Lodge where you will be welcomed with a traditional dance and some great food. This morning you will embark on a short trek through the unspoilt jungle to Mae Khi village. This is a Hmong settlement where the local hill tribe people still live a relatively traditional lifestyle. After saying goodbye to the Hmong villagers, guests get back in the saddle for the start of the second day’s ride. Leaving the mountain ranges behind, today’s ride passes through local villages lined with traditional Thai-style homes, heading towards Mae Rim. En route, the riders will have the chance to stop at several temples where they will be greeted by the friendly smiles of local monks and villagers. This is a great opportunity to learn more about the traditional customs and culture of the Thai people. Stop for lunch at a local restaurant before continuing on the last stage of the ride to the waterfalls of Bua Thong, located in the spectacular Sri Lanna National Park. Here, guests can enjoy some time by the waterfall and climb to the top of the falls via the natural limestone steps. This morning, you’ll depart Mae Taeng for a transfer over the mountains to Chiang Dao, where the day’s cycling begins. The first stop of the ride is at the Chiang Dao Caves, which you can spend a short time exploring before a having a quick snack and heading off by bike for the city of Fang. 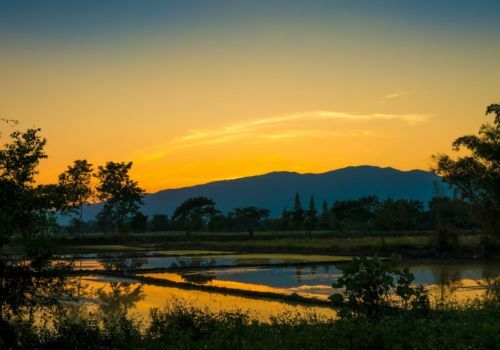 The majority of today’s cycling is on tarmac roads across rolling hills before a short transfer will take you to your accommodation for the night, which will be a basic homestay in Lahu village. This evening you will head out to a local restaurant to try the delicious Northern Thai cuisine. Today, set off along the quiet back roads of Fang. Witness the locals heading off in the early morning for their day’s work in the rice fields. This ride passes through some mesmerizing scenery, along lanes that weave between the rice fields before reaching busy village intersections where guests can witness the day-to-day hustle and bustle of the local villages. Stop for a snack before continuing through the Maekok river valley, stopping at temples en route. A barbecue lunch will then be served at a local restaurant. This afternoon, you will swap your bikes for a long-tail boat ride for a cruise downstream to Chiang Rai. 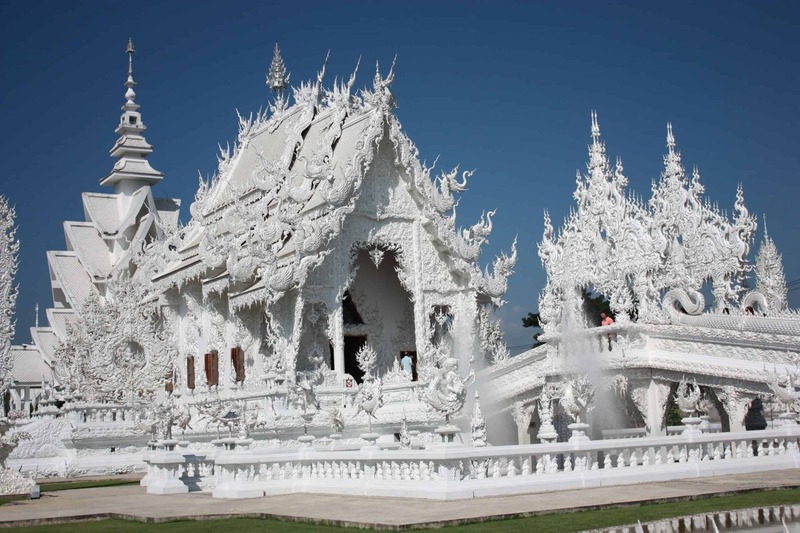 Back on dry land, the cycle ride then continues along back roads to Wat Rong Khun, also called the ‘White Temple’, in time for sunset. This evening dinner will be served at a local restaurant, after which guests can head out to explore the Chiang Rai night bazaar. You will wake up early this morning for a one-hour transfer from Chiang Rai to Chiang Kham, home of the Tai Lue people. The Tai Lue originate from southern China’s Yunnan Province and migrated to Thailand 200 years ago. After checking in at the resort, guests will get back on their bikes and set off through the rice and corn fields to observe the Tai Lue people at work in the fields. Heading into the jungle, the ride continues along a well-trodden trail, allowing guests to experience the region’s diverse flora, before entering rubber tree plantations and finally arriving back in the village. Stop for lunch at a local restaurant to sample the most delicious dishes in the Phayao district. Then in the afternoon, the ride continues along the quiet back roads and quaint villages of Chiang Kham, stopping at the temple of Wat Phrae Chao Nang Din. You will be able to take in the charm of the villages as you ride past traditional Thai-style wooden homes on stilts and wave at the friendly locals as they pass by. The next stop will be at the area’s most renowned weaving house, before finishing at Wat Nantaram, a Shan-style temple built entirely of teak. You are then taken to the Baedang bat cave for sunset. Enjoy breakfast in the serene surroundings of the resort this morning, before saying goodbye to the warm village life of Chiang Kham and cycling towards Lake Phayao. Stop at a local restaurant for lunch before continuing to the lake, set against the backdrop of the 1,826m mountain, Doi Bussacarun. 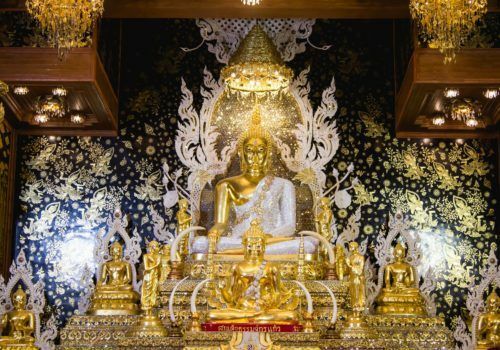 The day’s cycling ends in a quiet village temple, before you are transferred to Wat Si Khom Kham – a temple that houses a 16-metre-high gold statue of Buddha. Finish the day with a long-tail boat ride on the lake before sunset, before returning to the hotel to freshen up for an evening seafood dinner overlooking the lake. Finally a day of no cycling! Leaving Lake Phayao, you will be driven through the stunning mountain landscape of Doi Bussacarun, stopping en route at viewpoints and to sample some local barbecue food from the roadside stalls. You will then arrive at Mae Kampong village where they will be met by villagers and accompanied on a stroll through the community forest, passing tea and coffee plantations. Relax with a traditional Thai massage and take a walk around the village to see the processing of fermented tea leaves and other hand-made products. Afterwards, you are transferred back to Chiang Mai for a celebratory dinner next to the river in Chiang Mai, and a last chance to do some souvenir shopping at Chiang Mai’s famous night markets.